Easy breathing. Up to 8 hours release. Simple to use just plug it in! Easy-to-replace refill pads last up to 8-hours. Nightlight is activated at night when your lights go out. 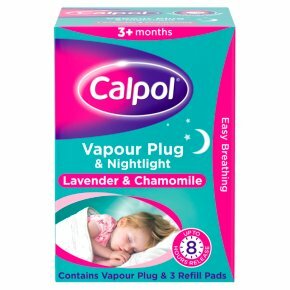 The Calpol® Vapour Plug & Nightlight contains a blend of aromatic oils including lavender, chamomile, menthol, camphor and eucalyptus. These oils help to soothe and comfort your child at night time whilst helping to ease breathing. Non-medicated aromatic vapours provide soothing night time comfort for your child. Directions for Use Cut across the top of the foil pouch to expose pad. 1. Using the foil to hold the pad, slide the pad into the slot of the vapour plug. When replacing a used pad, inserting a fresh pad will push out the old one. Dispose of used pads safely without touching them directly. Always wash hands after replacing pads. 2. Connect to power supply with the nightlight at the bottom. When using the vapour plug with a pad inserted, do not leave the unit in the plug socket for more than 16 hours at a time. After 16 hours, unplug the unit for a few hours before using again. Replace the pad before next use. Do not disassemble unit or nightlight. Nightlight goes on when the light goes out. When nightlight burns out replace entire unit. Do not block airflow of vapour plug unit or light sensor on bottom. If the light sensor is blocked the nightlight will stay on. 3. Unplug the vapour plug when not in use. To Insert a New Pad Allow the unit to cool for 10 minutes. Open a refill pad as described above. Inserting a new pad will push out the old one. Be careful whilst removing and inserting the new pads as the device contains hot surfaces. Remove and discard the old pad to use the nightlight alone. Use only Calpol® Vapour Plug Refill Pads with the Calpol® Vapour Plug & Nightlight. The use of other substances may give rise to a toxic or fire risk. Tips for Use: Allow 60-90 minutes for vapour to fill the room. Strength of vapour will vary depending on room size and ventilation. Vapour will be stronger, the closer the unit is to the user.